These cases are model specific and will not fit other makes or models unless otherwise stated. The cases for the large stereomicroscopes (BMSZ, BMZ and BSR for example) are to a degree generic as there are many combinations of heads and bases. Therefore the exact fitting position may vary from the example images shown below. 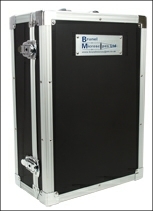 An aluminium attache case with lock and key that will fit all of our MX series microscopes. MX-1, MX-3, MX6T/7T. The internal structure is pre-shaped to provide security for the instrument. An excellent 'pilot' style carrying case with a solid foam proforma shape 'made to measure' for the microscopes. The case has reinforced edges and corners with a top carrying handle and bottom button feet. 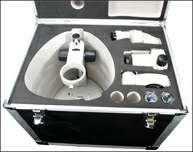 A compact aluminium carrying case for the Brunel Microzoom series of handheld and desk top microscopes. Spaces for all the components. Ideal for the travelling engineer. An excellent ‘pilot’ style carrying case with a solid foam proforma shape 'made to measure' for the microscopes. The case has reinforced edges and corners with a top carrying handle and bottom button feet. A substantial ‘aluminium carrying case for the SP150 and many of its accessories. This is a large robust case with double carrying handles. 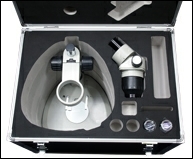 An large aluminium attache case that fits the SP50 trinocular microscope. A substantial case with double carrying handle and spaces for accessories. 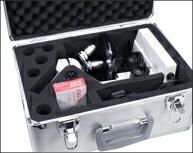 A compact aluminium carrying case designed for the SP29 handheld field microscope. The microscope fits in place with the light unit attached and there are spaces for other attachments. 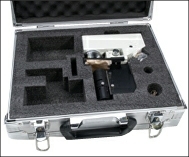 A compact aluminium carrying case for the SP20D digital microscope. The microscope is stored intact on its side with several spaces for its various accessories. 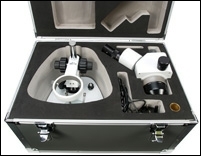 An excellent ‘pilot’ style aluminium case with a solid foam pre shape that will accommodate the Brunel SP27 or the SP27D digital microscopes. An excellent ‘pilot’ style aluminium case with a solid foam pre shape that will accommodate the Brunel SX10 stereo. This will only fit the new style unit sold since 2012. A substantial aluminium case with a solid foam pre shape that will accommodate the Brunel SP60 binocular and trinocular. A substantial aluminium case with a solid foam pre shape that will accommodate the Brunel BMX series stereomicroscopes with spaces for support equipment. A heavy duty aluminium case with a solid foam pre shape that will accommodate the Brunel BMSZ stereomicroscope with space for accessories. 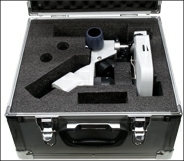 A heavy duty aluminium carrying case designed to fit our BSR series of stereomicroscopes. The base fits separately to the stereohead with ample room for accessories. 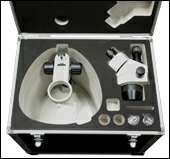 An aluminium carrying case for the MX10D digital stereomicroscope. 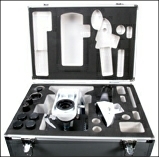 The solid foam pre shape allows the microscope to be stored safely and cleanly. Good value. This is clearly a substantial case for a substantial microscope built with the emphasis on mobility and the case has wheels and a telescopic pulling handle rather like a modern suitcase. 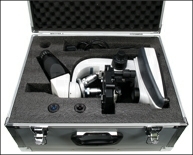 An aluminium carrying case for the IMXZ stereomicroscope. 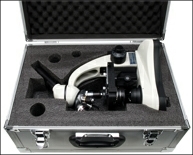 The solid foam pre shape allows the microscope to be stored safely and cleanly. Good value. 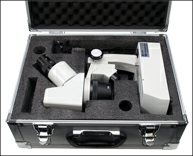 An excellent case for one of our most popular microscopes. The case will fit both the 45 degree and upright eyetube models.